Where can I leave a gift to charity? We go into how we first encountered legacy giving as well as how Farewill and charities can work together to help each other. When Farewill started back in June 2015, like the majority of the British public our founders, Dan & Tom, didn’t have wills. They didn’t even know what legacy giving was, let alone how important gifts in wills were — up to 65% of some charities’ fundraising income (I’m looking at you, RNLI)! As soon as we stepped back to think about it, it just made so much sense — what an amazing way to give to charity, and what an incredible gift to leave once you die. However, the more we dug into it, and the more we learnt from brilliant institutions like Remember a Charity and the great work by the Behavioural Insights Team, the more it became apparent that there was a great opportunity to really move the needle. There should be more gifts in wills — 5X the number in fact. Remember A Charity’s research has shown that whilst 35% of people would like to leave a gift to charity, fewer than 7% of wills actually contain one. That’s a massive lost opportunity for the sector, especially when the charitable intent is already there. As a new player on the will-writing scene (as you do) we wanted to do something about this. 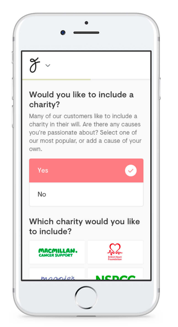 We decided from the get-go that every single one of our customers would get asked the question — “would you like to leave a gift to charity?” (not quite in those words — we use the social norm ‘ask’ detailed in the Legacy Giving and Behavioural Insights report report). The results were pretty amazing: in a matter of weeks we had 30% of wills containing a charitable gift (5X industry standard) and we’ve now raised >£10M in pledged future income. As we grow as a company we’re thrilled this number’s only going up. We’re always looking for new charity partners to prove the power of digital. You can find out more and arrange a demo on our charities page. £2.6BN is donated through gifts in wills each year – but how big is the opportunity? Discover the vital importance of gifts in wills to charities, the types of gifts you can leave and the tax advantages of doing so. Take 15 minutes & join thousands of people making their will the smarter way. Farewill is an online service providing legal forms and information. We are not a law firm and are not a substitute for a lawyer's advice about complex estate planning or estate administration issues.